I'm referring to the tipple used by the strip mine. It's in the book. There was also some additional photos in the Gazette article. I would love to see any photo or article on the Cliftop tipple. I had planned on freelancing a large tipple but I would rather use a prototype if I can find the right one. well everyone, I have been dumping a lot of coal so I can see what issues that come up and testing ways to get the cars to empty completely. I have been trying to get a small car shaker to work but it is surprisingly not as easy as I thought it would have been. what is making it hard is that I am trying to make it so it is not really loud and obnoxious. One idea that showed promise is the use of air to blow down the cars. it might sound like that would make a mess but i found it really did not take more than a light flow of air to push down the coal. I think if I make a small duct in the roof of the unloading shed with two openings, one over each end of the car, the very light flow of air will push down on the coal that gets stuck in the corners of the cars. I discovered this by lightly blowing on the car to get the coal to flow. I tested it with my airbrush compressor with the air flow choked way down. I think a small fan in a tube will provide enough air flow. a second issue (one that I expected) I am having is the dust from the coal. I tried using the ground rubber but it just to light and it locks together, which bridges the doors. I switched to a larger sized coal and it flows much better and has less dust but I really think that I need to look for something better. I had thought of using broken black glass which I could run through a rock tumbler to knock off the edges. if anyone has and idea I am all ears. There are two photo's that show one of the mines at Clifftop in the book. They are shots of other things, like the miners, etc. You have to look really, really close at the BACKGROUND to get and idea how it was laid out. 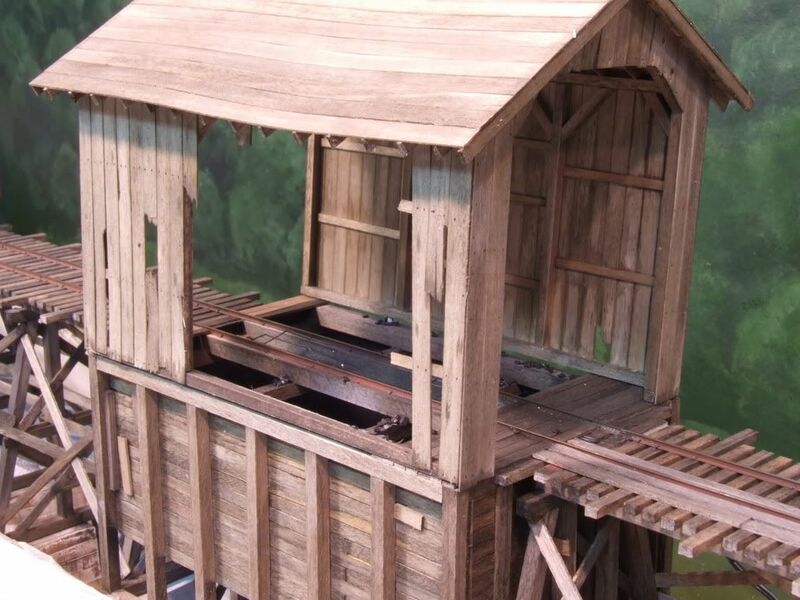 The pictures show the scalehouse and one of them has part of the tipple that loads the hoppers in the background. I have never seen a GOOD shot of the mines either. You could try "washing" your coal to eliminate the dust. Not fun but find a screen for the size you want and wash in water. that is the same photo that I know of as well. I had Ron send me the original so I could get a higher resolution image of it to study. that 180 degree view makes it a little strange to figure out what is were. 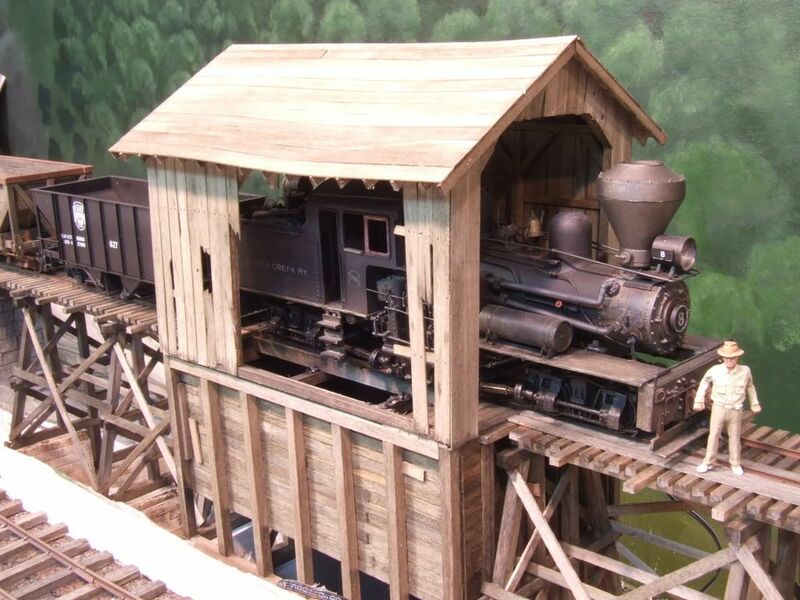 BTW, for those of you that are wondering how I made the Bachmann hopper work, here is a photo. it was pretty easy to do once I gave up trying to make the workings all hidden. since these cars are not my main cars I don't really care, I just wanted them to work good, and I am not going to lie, they do work really good, much better than the MC hoppers I am making. These cars work better because they do not rely on electrical contact and because the interior design allows the coal to totally flow out without any remaining in the car. If I didn't like the MC cars so much and wanted them to be my mainstay I would skip it and just use a fleet of these. To get the doors to work I used a chisel Xacto blade to pry off the glued on hopper doors. then I used a high speed cutter in my Dremel to open up the hopper bottoms, and I cleaned up the openings with an Xacto knife and file. Then I cut some 0.015 brass (4 pieces total) to make new doors. On top the doors I soldered a length of brass tube that had an ID of about 0.030. I slipped a piece of brass wire through two doors, pinned them to my solder mat, and soldered on a rectangle piece of brass accross both door bottoms to make two pairs of doors. 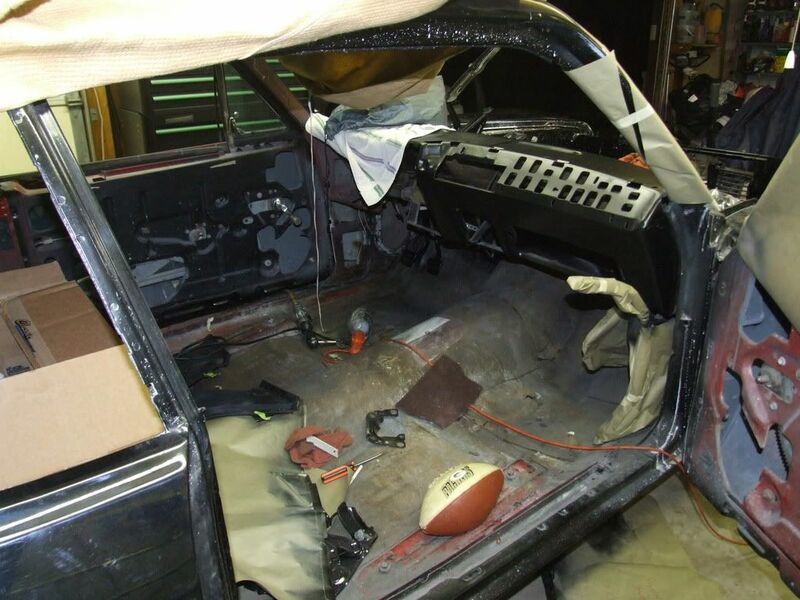 The doors were test fit to make sure they did not rub anywhere, which is very important for good operation. I used some styrene (8 pieces) to make the hinge pieces that get glued to the car body. I drilled a 0.030 hole in the styrene for the hinge wire, which is a piece of 0.030 brass wire. The next step is important, after the door pairs are soldered together drill out the brass tube to 0.036 ID but leave the styrene hinges 0.030. The reason I did not drill out the brass tube first is because I used the 0.030 brass wire to keep them in alignment, once soldered I drill them out so they are not so tight on the hinge rod. The doors must hang down by themselves and the extra slop in the hinge keeps them freely moving, there must be no rubbing or binding at all. once the doors were made, which went really quick, I made the latches. The latch is just brass wire again inside a tube. I soldered the tube to a piece of thin brass plate so there is a larger surface for the glue joint, it makes it stronger. These tubes are also drilled out so the latch bars (made from brass wire) will freely fall once the doors are shut. I found out the hard way that it is important to bend the latch end of the wire first, then position in against the door bar so the doors are closed and the bar is not a tight fit against the latch, I have maybe a 0.010 gap, again so it all operates freely. Also, it is very, very important that the latching face of the latch wire and the door bar are parallel, which will cause the latch wire to not be vertical but actually bend back to match the slope of the face of the door. This step is one of the most important steps because this design of the latch causes the weight of the coal to hold the latch in the locked position. 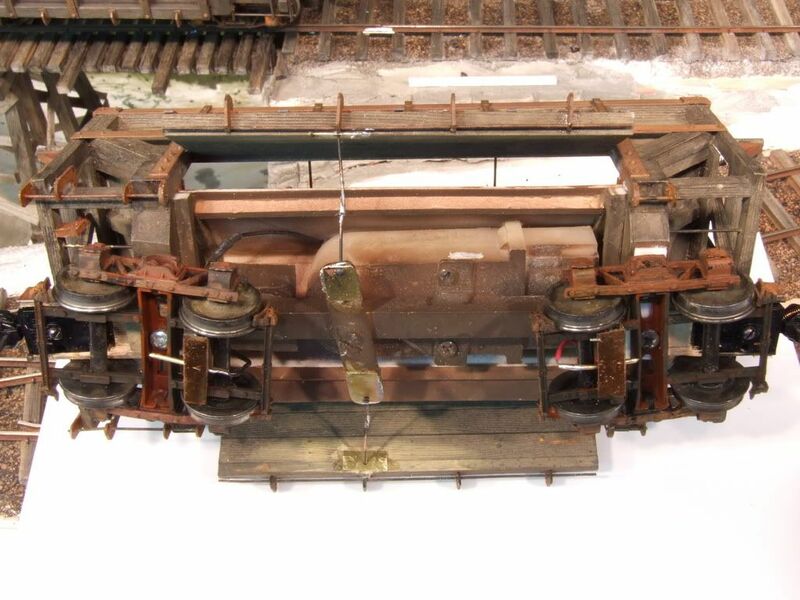 My first design had the latch wire face vertical and after I loaded the hopper and started pulling it down the track the door latch let go and I had a nice new layer of black ballast on my track. By making the latch first it is easy to slide the latch until it is in the perfect location before the glue dries. I use gel ACC which will "float" the brass tube for a short time until I get the latch in the correct location, then I just push the latch tube down for a couple seconds until the glue grabs. After the latch is glued down I bend the level end and snip off the extra. If you look at eye level you can see the latches and they look a little odd, maybe one day I will refine them and hide them. My eye already does not notice the handles that stick out of the car on the one side. I made my latches on one side only because my cars never turn, but it would be easy to solder up a latch that could be operated from both sides. Jeff, I wonder if you could use those newer "micro magnets" in some way. 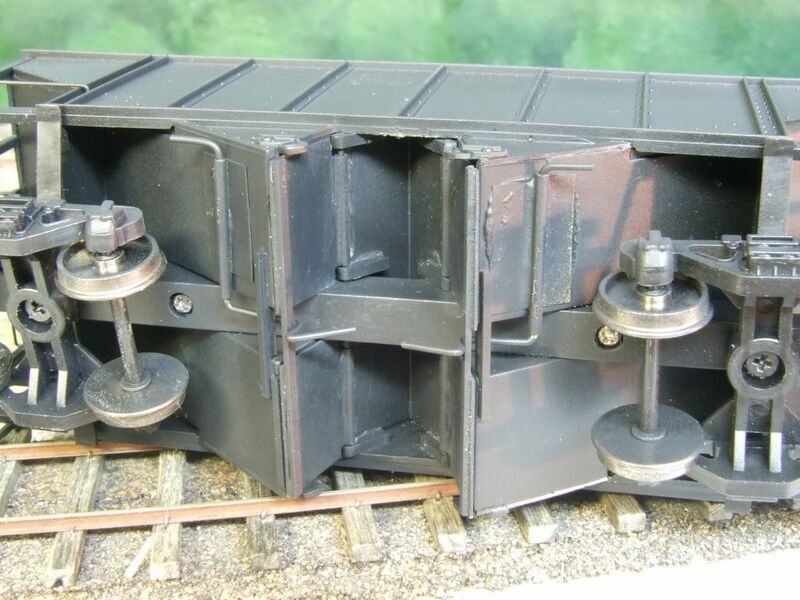 Perhaps the hopper door stay closed magnetically until you insert another magnet on a "unlatching stick" of some sort. Or maybe the unloading track is electromagnetically charged on/off and the hopper doors are pulled open when the on button is pushed, then they spring closed. I think you have a very workable design already, just brainstorming a bit. I think it would be pretty prototypical to ask your operators to manually unload each car. Takes some time but it's what they did on the prototype. Jeff, you might want to look at some black decorative sand for coal. I found some at Michaels. It comes in a small clear plastic bag. I use this sand in my working o scale ore bins and it flows well and even leaves black stains when it runs through the chutes. Great job on the Bachmann cars. I hope to make the trip up to see your layout one day. Getting caught up in here. Love all the progress you've made. A few thoughts. 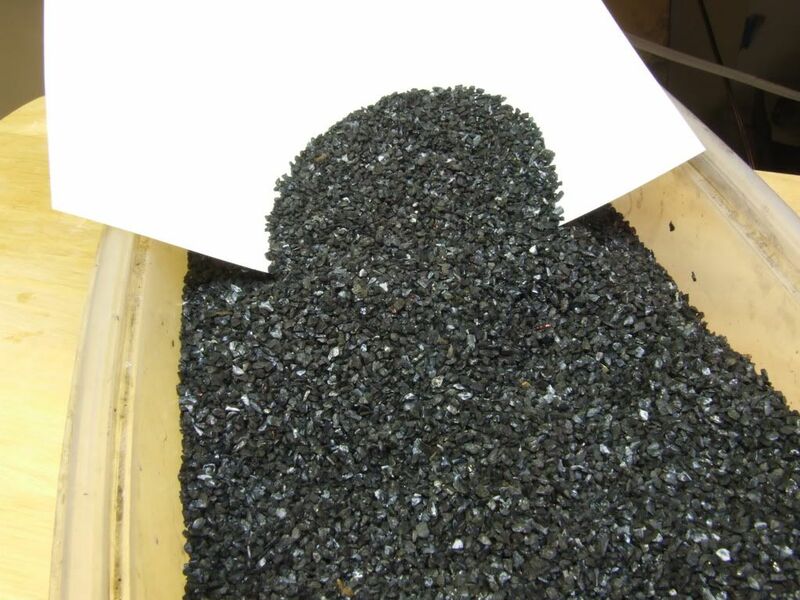 1) I think the black sand available at Michael's is a good idea- but if you are picky about using original coal, you could always spray them with a clear shellac coat to seal them- the only downside to them would be how glossy they would look afterwards. 2) My question as to the loose coal that gets stuck in the hopper: why is it necessary to clear out every time? Coal get stuck in prototypical hoppers all the time, and very few of them ever empty 100% Just a thought. Otherwise everything looks great and I vastly enjoy the progress you're making. The reason I want a car shaker to work is not to shake all the coal from the hopper car, I want it to shake the coal out of the door area. Sometimes there will be a couple pieces of coal that will sort of lock themselves together and bridge the door so I can't get the door closed tight. I am doing some testing with one car that may solve the door issue and maybe I won't need a shaker, but I would still like the option because once I get the shed installed I don't want to have to mess around if there is an issue with a car. On a side note, I just got a good deal on two boxes of Bachmann hoppers, now I will have six total, which is enough for what I want to do. 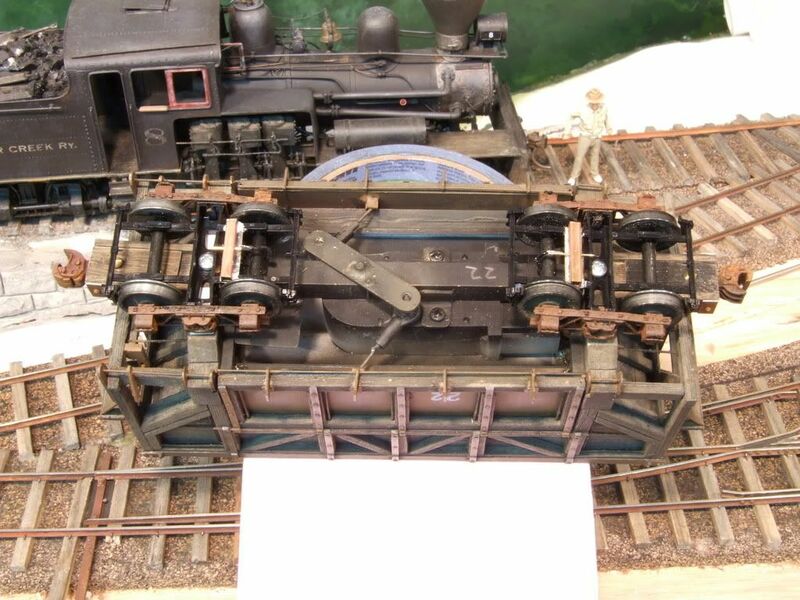 Your Bachmann hopper conversion is very slick. Standing in my to be built Ocean View trainroom last weekend looking at the NG coal tipple area and the wash plant/SG interchange your work makes it much more interesting! I sort of went off on a tangent over the last few weeks. 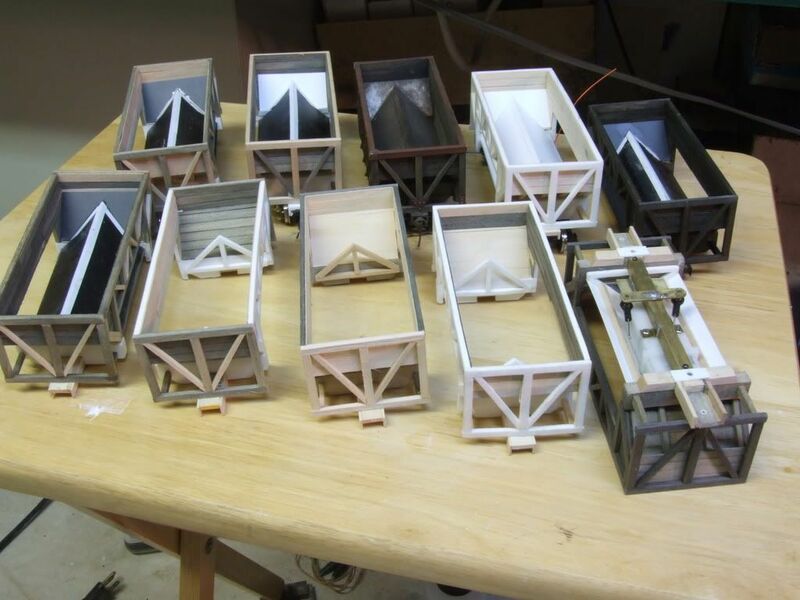 I was sitting at my workbench will the full intention to work on the unloading trestle, but I started to look at my hopper car jigs that I got from Shapeways and though I would test them out for a couple minutes, next thing I know I built eight hopper car bodies (over a couple weeks time). I had two other hopper cars started so now I have a total of 10 more hopper cars, plus the five I had finished, for a total of 15, which is half of my planned fleet of 30. I decided to build the cars in phases. Phase one is car body construction, phase two is mechanics, phase three is paint and weathering of the wood body, final phase is detailing and weathering of the details. One these 10 cars Phase one if finished on all of them (three of them still need the floors put in but that will be finished by the weekend. Most of these cars (except those same three) have phase two done. So the next step will be to paint them all my basic bare wood color and weather them. I don't pre-stain my wood because I use a mix of resin parts on some cars, so I paint a "wood" mix and then weather that with washes. I ran into a little snag with using the new SJCC #220 trucks, they hit my crank arm that is used to close the doors, so I had to redesign the frame on the new cars to use a lower profile crank arm design. The good thing is that I figured out a way to make the crank arm easier to build and install, and it is mounted higher and is harder to see from the side of the car (and it is cheaper to build). I also did some testing with my real coal to see if I can make it work better. I found that the really small pieces of coal were working sometimes getting stuck in the door parts. I redesigned how the arms are connected to the door to eliminate the problem but I also decided to screen the coal to remove the really small pieces. I screened the coal on a window screen, which I can do over the years to keep the number of really small pieces to a minimum. I also tried washing the coal over a screen to reduce the dust. in the photo below you can see a sheet of white paper that I poured the washed coal on and there is no coal dust at all. I know that over time the coal will produce dust but I can also wash the coal when I screen it over the years, I just do it outside and it really is not a big deal. My goal is to reduce the dust, not eliminate it. 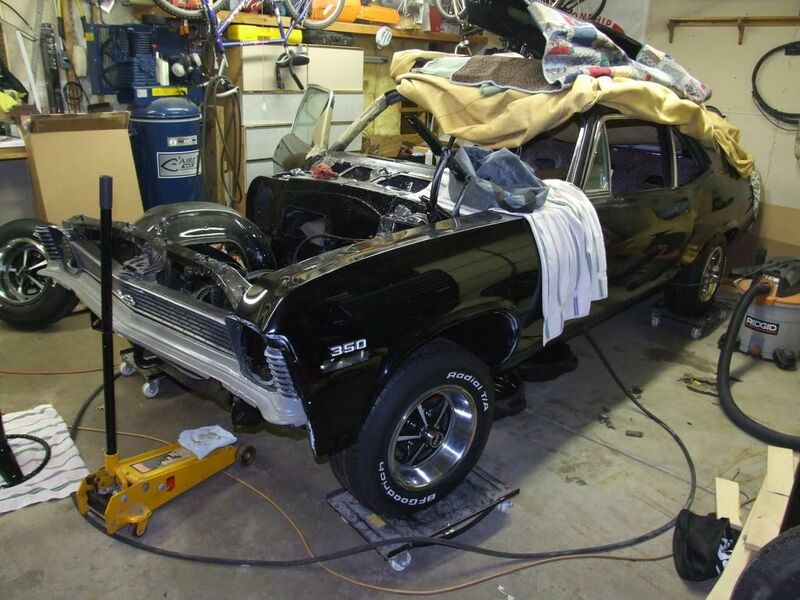 also what is slowing me down is my summer side project of restoring my 1970 Chevy Nova SS. I hope to have it done by mid summer. the car project is moving along slowly and taking most of my time these days, but I do slip in a little railroading every now and then. 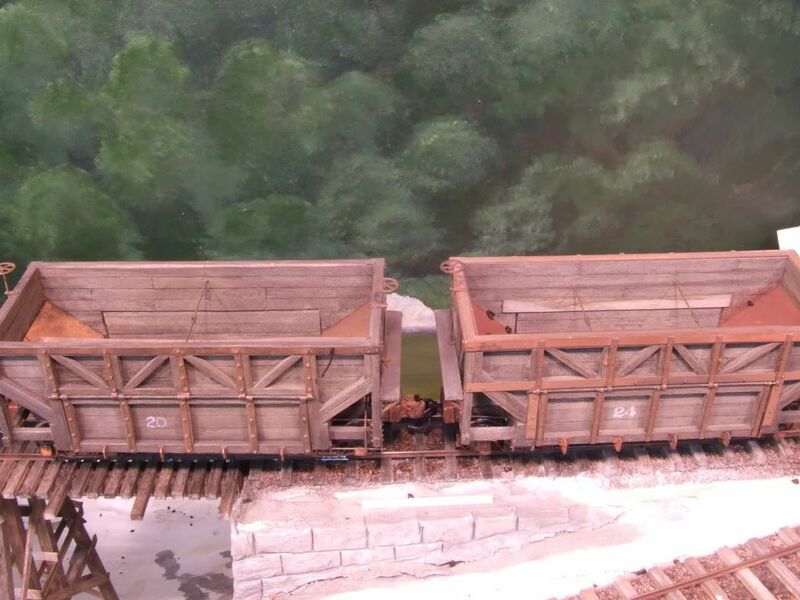 I have all ten of my new hopper cars painted my bass color and two have been weathered. My base color is a mix of Floquil earth, concrete and antique white. The weathering is 2-3 washes of IA and one wash of burnt unber and black mix of thinned acrylic. these and future cars I am going for a darker brown black color to match the color photo of a Manns Creek hopper on the cover of the book "Trackside in West Virginia, in search of steam". I also have been doing some more tweaking on the original five cars to get them to work better. Now that I have dumped a lot of coal I have found some issues with the original design that has been giving me some trouble. The problems are being caused from small pieces of coal getting stuck in places that don't let the doors close after dumping. if you look at the top photo below you can see that I have small brackets that joint the bell crank rods to the doors. Sometimes after dumping coal I would get a piece of coal that got stuck on the brack and since those brackets just clear the slope sheets the piece of coal would jam the doors open. to fix this problem I removed the brackets and used used my Dremel to make a small depression in the door, then I took a piece of brass, drilled a hole in the brass a little larger than a pin, insert the pin through the hole and glue the brass piece over the depression so there is nothing protruding from the back of the door now. Didn't know why I didn't think of that the first time but what a difference that made, it is easier to build and it works so much better. I also removed the ball joints that I used on the bell crank, patched the large holes with a piece of brass and used a pin with a 90 degree bend for the throw rod. I hold the door closed and use a tweezer with modified jaws to hold the two pins next to each other and solder them together. What I like about this method is that it is cheap, fast, and I get both doors to close tight to the floor. the old method for attaching the doors to the bell crank always made it hard to get both doors to close all the way and I would get some coal leaking out the bottom of the doors, which I am sure the real cars did this but they ran outside. Future cars will look prettier . The second modification I had to make I am not so happy with, but if it makes the cars work better then I will live with it. Because the doors do not open very far the top edge of the door does not slope at much of an angle. As the doors open a gap forms at the top of the door and the car body and sometimes coal will go in the gap and not be able to drain out because the slope is so shallow. My first idea was to bevel the top of the door, which worked better but when the door was closed there was a larger visible gap between the top of the door and the car body and coal always filled the gap, it looked bad and coal was still sticking in the joint. My second idea was to add a thin board across the top of the door that over lapped the door a little and provide a shield to block coal from going in the gap, ta-da, works like a charm. I don't like the look of the board over the door but it works too good to not use it. I took a photo of a car with a light board so you can see it better, I will weather it to match so it will blend out of sight better. the car on the right has the new door joint board. 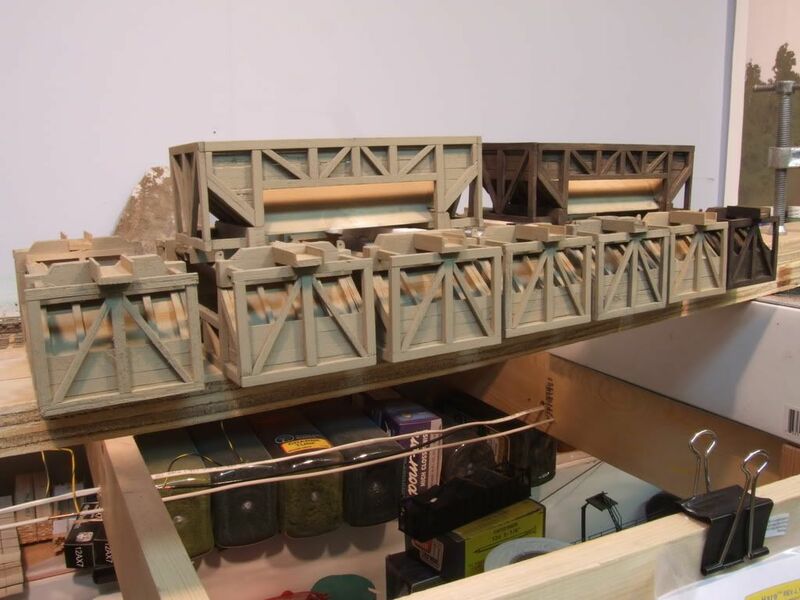 finally, I got a little more done to the dump trestle. I have started the shed over the dump pit, it is built board by board and has full framing. I built the frame and tacked it to a piece of styrene so there was a slight lean to the back. When WWII started the MC removed a part of the wall and built a bridge to allow dump trucks to dump coal into the bin that the hopper cars dumped into. When they removed a section of the wall they had to take out some of the post which caused the roof to sag and the shed to lean a little. I removed one of the post and I broke the top plate, which was glued back together with a sag. I can still see the contact wires for the hoppers but that might be because I am looking for them, I think most visitors will not notice them at first. I still have to get the end wall sided and some tar paper on the roof. Anyway, I like the dump trestle shed. It adds so much to the whole scene. I don't really understand why the new hardware on the doors would work better than what you had. But easier and cheaper is very easy to understand. The sagging shed hanging over the steep slope makes the coal dump area seem even more hazardous.